A horse riding safari is a unique experience for those who would combine the pleasure of riding with the thrill of an African safari. Exploring the beauty and serenity of the African bush on horse back has to be one of the most rewarding ways to discover some of the continent's finest wildlife and wilderness areas. Whether in Kenya, Botswana, Tanzania, Uganda, Malawi or South Africa, the scenery is stunning, the service is superb, and the genuine feeling of proximity to the wildlife is unmatched. Share in the sights, scents, sounds and excitement of the African wilderness. We have selected some of the very best horse safaris operating in Africa. Each operation sets a very high standard of professionalism in equine care, guiding and accommodation, combining care for the client with unrivalled personal attention to detail. Horses and tack of the best quality and traditional camping comfort of the highest standard are provided. These horse riding safaris are of a highly personalized nature, each maintaining their own individual character. Each offers a personal insight combined with a commitment to, and love for, the areas in which they operate. 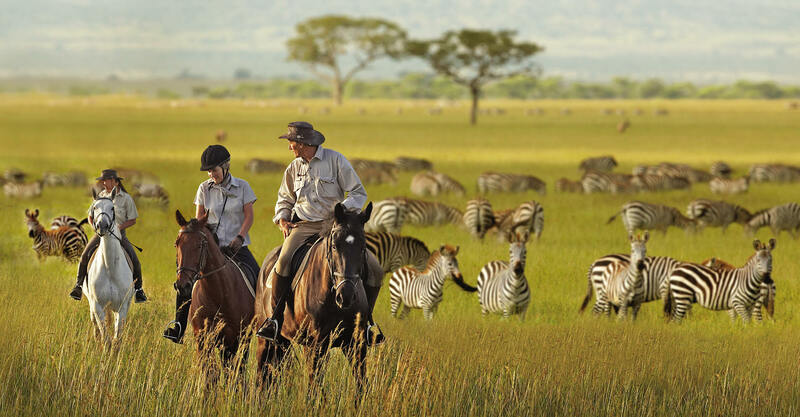 By choosing from our selection of safari options you will be riding with some of the most experienced guides and operators of horse safaris in Africa, and whose depth of knowledge of their respective environments will enhance your African safari experience. Whilst we have a number of horse riding safari options available in various parts of Africa (see examples below), in choosing a suitable horseback safari for you, we would need to consider many options, depending on time and budget, before selecting the most appropriate. If you are looking for a horse riding safari please complete the Start Planning form at the bottom of the page and we will provide you with some options. 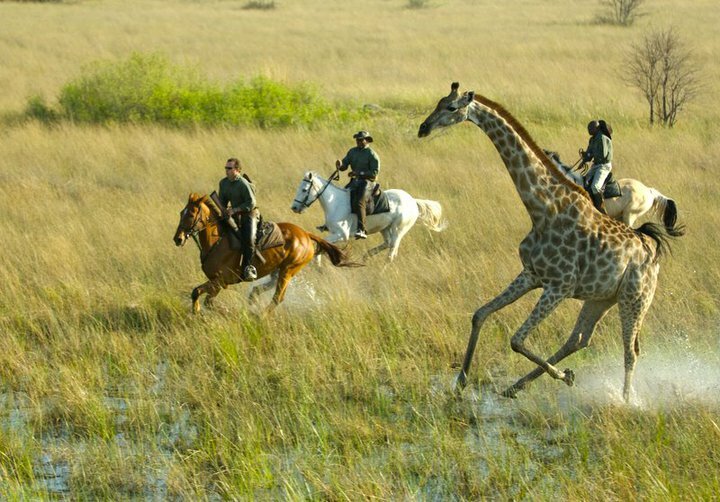 Riders can now experience the ultimate African adventure ~ exploring the vast wilderness of the Okavango Delta from horseback. You can ride with a herd of giraffe or zebra across the plains, track elephant or buffalo from island to island, canter and splash through the lagoons of the delta with lechwe antelope or simply watch the setting sun whilst listening to the calls of lion and hyena. Qualified guides will lead you on this journey, sharing with you their intimate knowledge of the wilderness. You learn how the Delta's life-giving waters spill into the sands of the Kalahari changing the landscape from endless seas of grass into sparkling water meadows attracting herds of game. Riding groups will normally be no more than 6-8 guests. To explore the Okavango in depth we recommend a minimum stay of seven nights which will enable you to visit a fly-camp - weather permitting (although you can stay as little as five nights). You can also take game and night drives, walk with a guide or go out in a boat or in canoes in the flood season. Shorter safaris are also available. The horses are much loved, well mannered and in excellent condition. From Arab cross breeds to large Hanovarian thoroughbreds there is a horse to suit everyone with comfortable English and Western trail saddles. 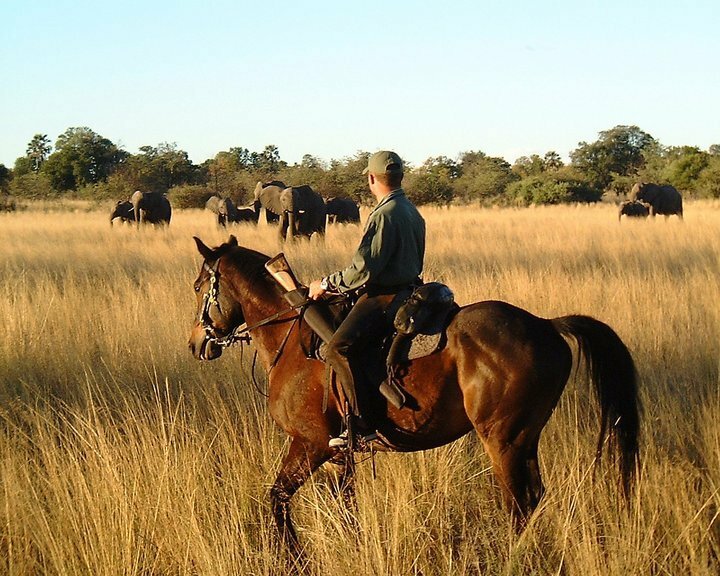 The horse riding safaris are based from a permanent safari camp deep in the heart of the Okavango . This is a small comfortably furnished en-suite tented camp, providing you with the creature comforts of life while allowing you to experience the wild beauty of the African bush. 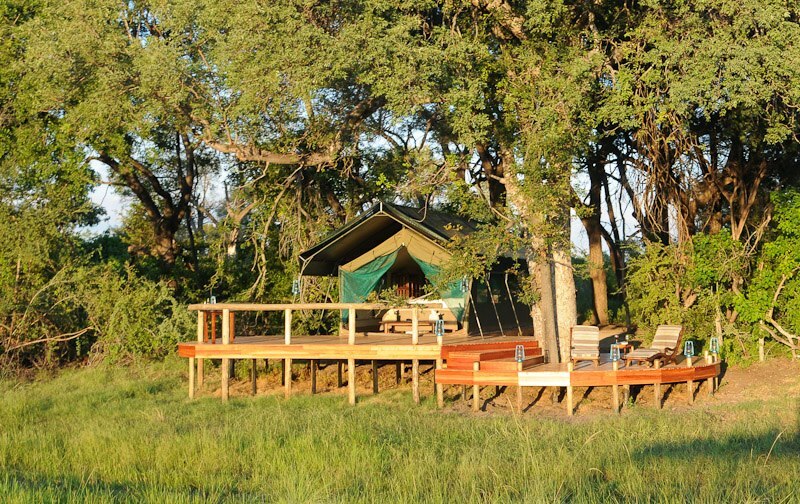 The camp features large, walk-in, twin bedded tents, each with their own en-suite shower and toilet. Centrally there is a large furnished mess tent and tucked away a private pool. The camp is open from March through to January and accommodates a maximum of only 12 guests. Fly to Maun where a light aircraft will spirit you away into the depths of the bush where your adventure will begin. The riding terrain from camp is scenically varied in all directions. Riding Ability:These safaris are for riders. We spend 4 to 6 hours a day in the saddle. You will need to feel competent about keeping up with the group, capable of riding at all paces; rising to the trot and controlling your horse at the canter. You may be required to gallop out of trouble, so we cannot take beginners (although non-riding partners can also be catered for). "There is no magic on earth to beat it. The riding safari ... in the Okavango Delta was a life's dream. From childhood I had yearned to go and see the game of Africa , but tales of a dozen Land Rovers surrounding a few lions had started to put me off. However, this safari was so natural and perfect. Seeing everything from horseback made me feel part of the environment and in touch with it. For ten days in Botswana , I was able to share wild Africa with its animals. It was an extraordinary time. I learnt more about wildlife than I have in the past 10 years, I saw things I couldn't believe and had more fun than you can possibly imagine." In the remote north eastern corner of Botswana, at the confluence of the Limpopo and Shashe rivers, lies an area known historically as the Tuli enclave - a diverse wilderness of savannah, riverine forests, marshland, open plains and sandstone outcrops. It is here that you will find Mashatu Game Reserve, an immense tract of pristine game viewing wilderness. The area is home to many of Africa's giants including a large population of elephant, all the big cats, giraffe, the baobab tree, the eland and the ostrich. It is a place of exceptional beauty where one can explore the rugged, unspoilt African landscapes on horseback guided by expert rangers. In addition to the game experience, Mashatu offers notable archaeological sites including the Motloutse Ruins and the Pitsani Kopje sites. The terrain comprises a network of dry river beds, rocky sandstone outcrops and high ridges that afford a view for many miles across Africa's vast game rich plains. A horse safari in the "Land of the Giants" will arouse the explorer in you. Allow the spirit of your horse to carry you in rhythm with the African beat, to return you back to an age old Africa. Where herds of elephant roam, where the infamous "great, green, grey, greasy Limpopo" (in the words of Rudyard Kipling) meanders, where the mighty baobab stands tall and where lions and hyena serenade you under the starry African night sky. Our 7 to 10 day horse riding safaris in Tuli use both the Machatu Tented Camp (6 twin bed chalets, each with en suite bathrooms and set on stilts, under shady Mashatu trees and lush green lawns) and specially established wilderness fly-camps (offering accommodation in canvas dome tents with stretchers and sleeping bags, camp fires, paraffin lanterns, bucket showers and hygienic pit latrines). The Central Kalahari is a vast sea of grass offering the visitor a host of desert adapted species including springbok, gemsbok, meerkats and the Kalahari black-maned lion. A selection of lodges in the Central Kalahari offer riding safaris suitable for everyone - from experienced horsemen to complete novices. Rides can be of any length from one hour to three days* - so there's something for everyone. On horseback the game animals are less wary of the horse, so you are able to get much closer to the wildlife. The horses are fully trained and well used to being ridden, plus they are also very familiar with the local terrain. On longer rides, guests are often accompanied by the local bushmen who will point out interesting features and plants, adding to the experience. The site of an ancient lake which has since dried up, the Makgadigadi Salt Pans are the size of a small European country, with vast salt flats surrounded by open grassland - fabulous for cantering and faster riding. Together with the endless vistas and unspoilt wilderness for horse riding there are many other attractions, including some of the best star gazing in Africa, the delightful meerkats, the enigmatic aardwolf, brown hyenas, and the San Bushmen - considered Africa's oldest indigenous inhabitants. During the late rainy season (March-April) up to 25,000 zebras migrate into the pans from the Okavango Delta – a round trip of some 580 kms. * Please note longer rides are only available by booking in advance. Horse-riding safaris in the Masai Mara and Laikapia regions mostly operate from luxury mobile tented camps in remote areas. Game is plentiful everywhere that riding safaris are conducted - dangerous game abounds. Your guide is knowledgeable and conversant with the habits and likely reactions of the game, in any situation you should follow any instructions closely. Most of the rides in Masailand and the Northern ranches are on fairly open plains (black cotton soil) interspersed with bush. They are short grass plains ideal for riding. Care must be taken for holes but canters and gallops are taken on open plains. All set departure horse riding safaris offer additional nights at Deloraine in the Rift Valley near Nakuru. This old colonial house was built in 1920 by Lord Francis Scott, a predominant early settler. There are lovely rides on the surrounding 5000 acre farm, the gardens are themselves worth the visit. There are several interesting day trips to the flamingo lakes of Bogoria and Nakuru which are within easy reach by vehicle. Other activities include game drives, night game drives and game walks are undertaken on every safari. There is no lack of activities on safari. All horses are well schooled thoroughbred and thoroughbred cross. Many are home bred out of our best mares. All are tried for polo and our best polo ponies all go on safari. Therefore responsive, tough and fit. You will be pleasantly surprised. Good riding ability is important and you should be comfortable at all paces and able to gallop out of trouble. We ride in big game country. You should be fit enough to ride between 4 and 6 hours a day. Weight limit 210 1bs, 95 kgs. Length of rides are 4 - 6 hours in the saddle. Picnic lunch carried in saddle bags on moving days. 1 1/2 - 2 hour lunch stops. Some walking on foot necessary over rough terrain. There are a minimum of 4, maximum of 12 in a riding party on set departures. Tack: English. Various saddles, polo, wintec, French trekking and Australian stock. Mainly snaffle bridles. Accommodation on safari: Tents are 10ft x 9ft traditional safari style green canvas with wash stands and a short drop loo adjacent. Showers are readily available. Bedding, sheets, and towels are provided and twin safari cots are the norm though we do have 2 double beds available on request and of course for honeymoon couples! There is no electricity in camp and lighting is by gas and hurricane lamps. Our Horse Riding Safaris around Kruger in South Africa are based on a private game reserve close to the Kruger National Park, with the Drakensberg Mountains as a backdrop to one of the most beautiful wilderness regions in South Africa. The variety of land mammals, birds and plants is unique and breathtaking. It has various ecosystems ranging from open plains, woodlands, hills and rock formations, to riverine and gullies. Many rivers are the lifeline of the region and support an impressive population of flora and fauna. Huge fig trees, Jackal berries and other exotic plants grow along these rivers. The region is the home to wildlife such as elephant, rhino, lion, leopard, buffalo, cheetah, wild dog, hyena, giraffe, zebra, blue wildebeest, hippo, crocodile, bushbuck, kudu, nyala, waterbuck, impala, warthog and many different species of birds. Seeing these ancient creatures from the back of a horse in its natural environment without disturbing the fauna and flora is absolutely unique. The success of the operation relies on the quality of the horses. Special breeds have been selected and carefully trained to suit the purpose of a Horse Safari. The discipline of the horses and the group is necessary to secure the safety on trail. Our team will do everything to give you the experience of a lifetime. Accommodation is in double-bedded canvas safari tents on platforms individually built and furnished in African safari style with private outside bathroom. From the decks you enjoy a magnificent view over the Makhutswe River. After an exciting, hot day you may enjoy a drink at our bar or relax at the swimming pool. The main area is equipped with a library giving you the chance to read about the wildlife, flora and fauna of South Africa. For that personal experience our knowledgeable guides will accompany you throughout your stay and share in all the excitements together. If you are flying in and out of Johannesburg you might want to consider a horse safari only a few hours outside Johannesburg. Situated in the malaria free Waterberg mountains of northern South Africa, just two and a half hours north of Johannesburg you will find a number of horse-riding options including Horizon Horseback Safaris and Ant's Nest. The topography is varied with vast sandy tracks, wetlands, dams, bushveld and rocky outcrops; all perfect for exploring in long stirrups, featuring a diverse riding holiday perfect for singles, families, experienced and novice riders . Set in private game reserves with plains game and hippo, but no other dangerous game. Outrides through game reserve and cattle ranch . Swimming with horses . Polocrosse, cattle mustering, and jumping. Special occasions and weddings . It has a relaxed and friendly atmosphere; people arrive as guests and leave as friends. For non -riders: - there are a number of things to see and do, including game drives on a nearby Big 5 reserve - please see further details on the attached sheet. 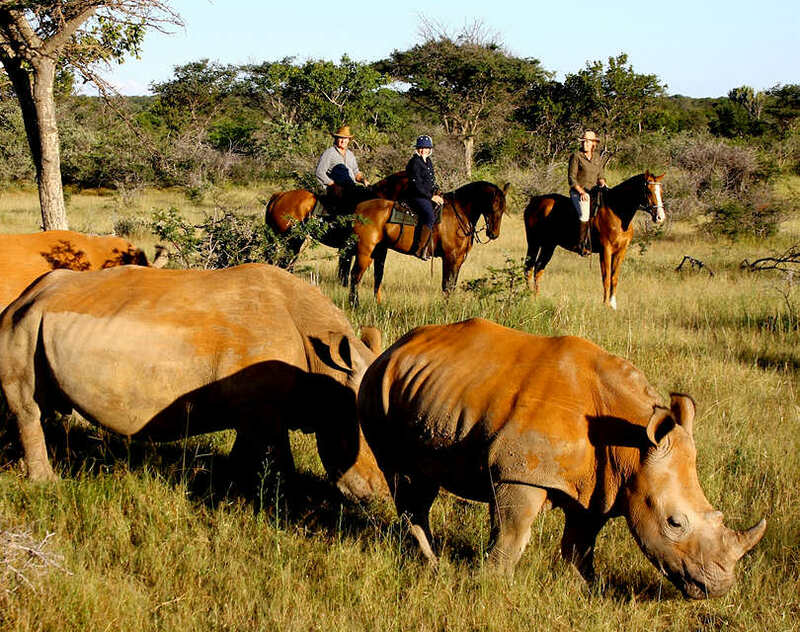 Horse riding is also available in a number of private game reserves around South Africa. If you are not looking to do a full horse riding trail over 5 to 10 days then these may be a good alternative. Mihingo Lodge, just outside Lake Mburo National Park, offers wonderful horse riding year round. Rides are carefully adjusted according to the riding skills of each group; for beginners and inexperienced riders we only walk the horses. In fact a walk on a horse is the best way to view game. It is peaceful and relaxing and you get very close to the animals. For advanced riders there are also lovely stretches for trotting and cantering. There are 7 horses between 14.2 and 17 hands and 4 tough Ethiopian ponies which are about 13 hands. The Lodge has a concession to operate horseback safaris inside Lake Mburo National Park where they can offer some fantastic routes. The best ride in the park is a 4 to 5 hour ride onto the 4 km long grassy Warukiri Range situated in the middle of the park with stunning 360 degree views of the surrounding hills and valleys in the Park. At the end of this range there is a waterhole, which often attracts buffalo's and other animals combined with a magnificent view onto 9 of the 12 lakes surrounding Lake Mburo National Park. This ride changes the whole feeling of the park, making it absolutely spectacular. Horseback safaris are also available around the lodge itself. Without any engine sound and fumes you feel part of nature and often get the chance to see the more timid animals. It is an exhilarating experience not to be missed. Guests often see eland and buffalo and nearly always warthog, topi, impala, duiker, bushbuck, waterbuck and zebra on our horseback safaris, although this depends very much on the time of year and the rainfall in the area. Experiencing game from horseback is very special; zebra come towards you to check out the strange relative without stripes. Even the normally very shy eland curiously look at the horses without running away, just keeping their distance. The lodge provides fully adjustable helmets in all sizes and chaps. There are both English-style or western-style trail saddles. It is recommend that you wear long trousers and strong shoes if possible with a heel. Rides are limited to no more than 6 guests out at a time. All the rides are accompanied by at least one experienced horse guide, but in most cases there are 2 guides accompanying each ride. Opportunities for horse riding in Tanzania are to be found in the northern region encompassing Mt Kilimanjaro, the Ngorongoro Highlands, Lake Natron, Lake Manyara and the Serengeti (see examples below). Choose between rides within the boundaries of Arusha National Park, through the wilderness corridor between Amboseli, Mt. Kilimanjaro and Mt. Meru or on Makoa Farm, a plantation with coffee, maize and beans (and horses) with the perfect terrain for riding. Based on the outskirts of Arusha Town, at an altitude of 1400 meters above sea level, the Kaskazi base is the ideal climate for horses and riding. The stables have a magnificent view of Mount Meru, with Mount Kilimanjaro to the north on a clear day. Day rides takes place from the stables, while on a mobile safari the horses are trucked to the location. Horse riding safaris are offered in the Amboseli and Mt Kilimanjaro areas as well as Lake Natron and Kusini in the Serengeti. The owners have a great love for horses and a passion for Africa and its people. Come and explore the remote African bush from the back of a horse, and on foot, combined with visits to the many unexplored areas of Tanzania, away from the many crowded destinations and vehicle traffic. Manyara Ranch is situated within the wildlife corridor between Tarangire and Manyara National Parks - a 35,000 acre wildlife conservancy. The Conservancy provides guided game walks, day and night drives, 4x4 safari extensions to nearby parks, visits to partner villages and activities including horse riding with big game, bush breakfasts and dinners and participative research activities to promote ongoing conservation projects in collaboration with the African Wildlife Foundation.